So far Core BioVisuals has created 6 blog entries. Artistic illustrations are the oldest form of communication. For decades, medical illustrators have created images that have explained anatomy, biology, surgical procedures and sciences that are difficult to conceptualize or physically impossible to see. Medical illustrators can depict cellular processes or internal surgical procedures with dynamic yet comprehensible visuals. As medical practices change and new scientific discoveries are made, medical illustrators adapt to these shifts and provide the necessary visual tools to educate, clarify and solve communication problems in the industry. The importance of a medical illustrator to have a strong background in artistic, medical and scientific education is crucial to the growing field of medicine and brings enormous value as a professional. The values of a medical illustrator are based on the ability to problem solve, the capability to adapt to challenging situations and the intelligence to innovate explore new ideas to visually communicate. Who is a medical illustrator? 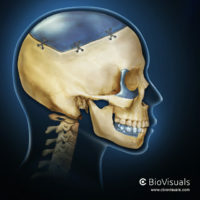 A medical illustrator is a highly skilled professional artist with the ability to visually communicate and problem solve. Most medical illustrators have acquired a master’s degree from an accredited graduate program. The experiences gained during the duration of the program contribute to the capacity to find new ways to effectively communicate with a variety of people. Medical illustrators will attend lectures that involve working along side medical students. The course load includes human anatomy, clinical studies and cadaveric dissections that strengthen their knowledge of the human body. Histology and pathology are studied to gain a better understanding of the cellular processes and medical anomalies within the body’s systems. With this education and understanding, a medical illustrator possesses the skills to problem solve and communicate at a healthcare professional level. 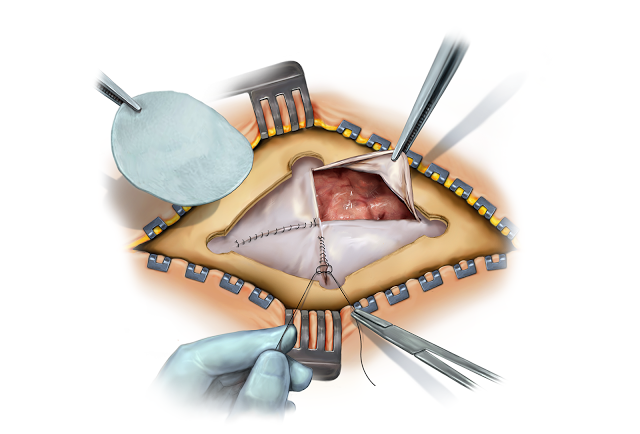 Medical illustrators work with surgeons to illustrate a specific surgical procedure, collaborate with medical legal firms to create illustrations for surgical malpractice trials and they can produce effective visuals for pharmaceutical companies. A medical illustrator’s creative versatility and flexibility help them overcome obstacles. Illustrators can capture a mood, atmosphere or emotion that appeals to a specific audience. This can improve the effectiveness of communications that lack and are limited by text and words. They can illustrate new devices or procedures that are only conceptual and can focus on a certain feature that otherwise would be overlooked. Medical illustrators explore new, innovative ways to create compelling images that fuel a technology driven society. They generate 2D, 3D and interactive visuals that cater to a technology driven society. As a professional, the value of a medical illustrator is endless. Medical illustrations provide more than a photograph or simple text. As a medical illustrator the abilities to problem solve, be versatile and thrive on new ideas and innovations, makes us indispensable. References Shannon, Stephen. (2015). “Can Gene Editing Techniques Like CRISPR-Cas9 Be Used to Replace Mutated Genes in CF?”. Web. 16 Apr. 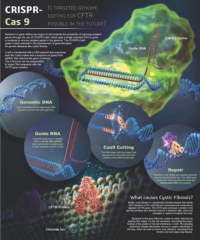 2015. https://cysticfibrosisnewstoday.com/2015/04/16/can-gene-editing-techniques-like-crispr-cas9-be-used-to-replace-mutated-genes-in-cf/. 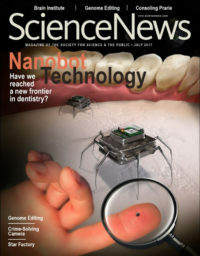 Nanobot Technology | Have We Reached a New Frontier in Dentistry? Researchers are exploring a long list of ways that nanotechnology could make your visit to the dentist more comfortable, and make the result more effective and attractive. 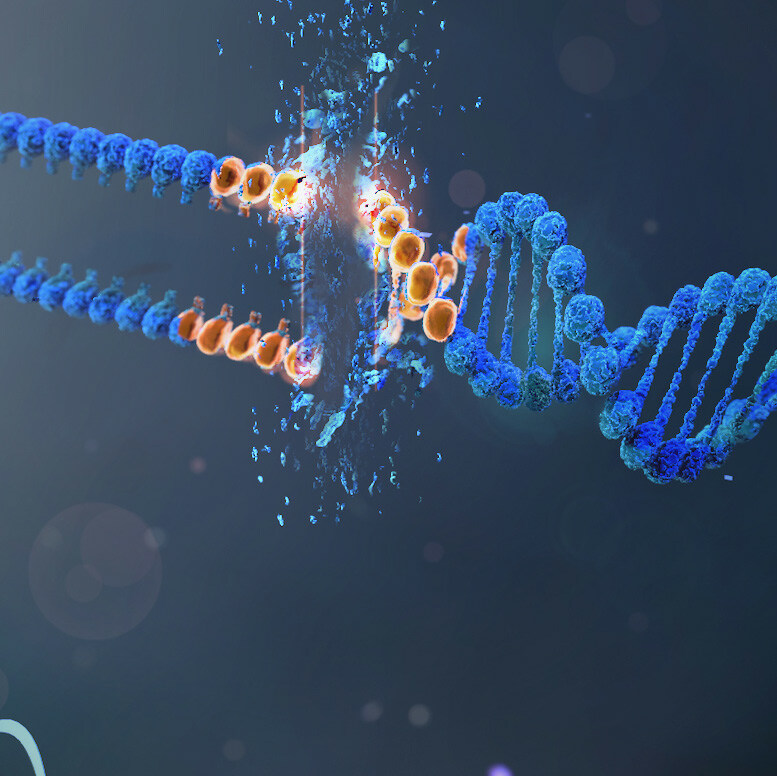 Delivering therapeutic drugs with nanoparticles or nanorobots that go straight to the source, enabling smaller doses and reducing side effects. 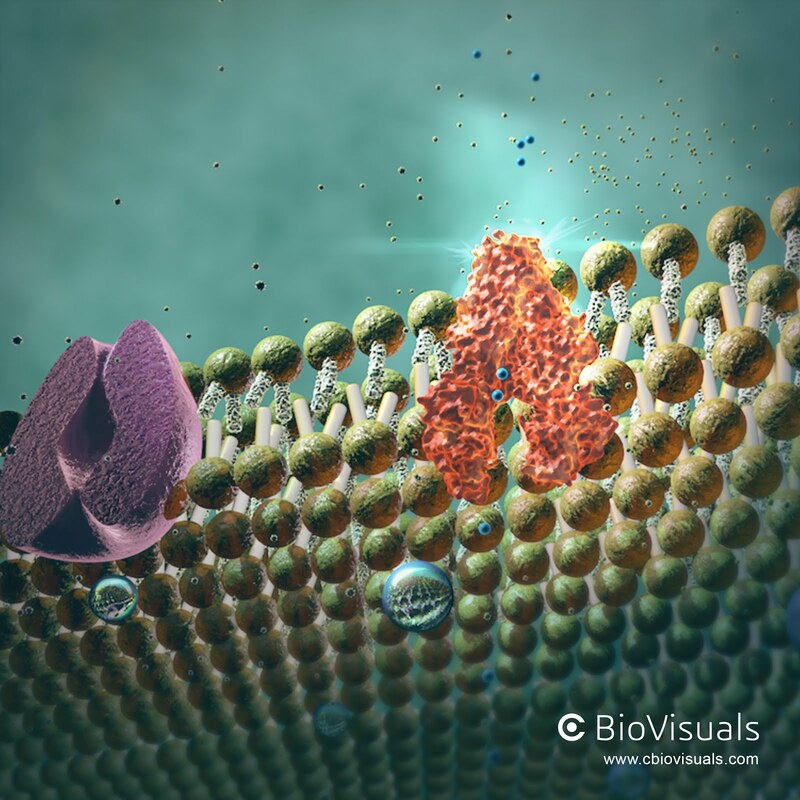 At Core BioVisuals each biomedical illustration serves as a vehicle for knowledge visualization, communicating and transferring a message between the reader and the author. We took on this publication. Advances in technology have increased our ability to manipulate the world around us on an ever-decreasing scale. Nanotechnologies are rapidly emerging within the realm of medicine, and this subfield has been termed nanomedicine. Use of nanoparticle technology has become familiar and increasingly commonplace, especially with pharmaceutical technology. An exciting and promising area of nanotechnological development is the building of nanorobots, which are devices with components manufactured on the nanoscale. With these interesting advances in technology, the interest of the public is always at there. This informational pieces, shows the build/imaginative design of nanobots in the body environment to open up the world of curiosity and excitement about the ongoing projects, as well as inform the general public about the continuous advancements in medicine. Rapidly evolving and improving, the purpose of simulators currently bring the sensation of real life clinical scenarios to students without the risk of harming patients. Simulators are not restricted to clinical settings, preferably this projects aims to be used at any time outside of the clinic and class. The use of this project will not replace real clinical practice, but is intended to enhance the student’s ability to realistically and safely practice medicine. The production process began with heavy research using the materials Dr. Turrentine at Augusta University advised and other helpful resources. The decision was made to use my own facial features for the pilot model. Using 3D scans from the Augusta University Orthodontic Clinic, high resolution images were obtained and imported into Cinema 4D for further modification.Both Cinema 4D and Z Brush were used for the general modeling, rigging, animating and UV mapping of the model. After multiple revisions, the refined model was imported into Unity. The general interface, consisting of five separate scenes were created in Unity in addition to the interactive assets, buttons and scripts. In order to make the interface seamless, C Sharp and TouchScript scripts were implemented. After completing the interface, the program was then built on both iOS and Windows platforms. The production process overall was quite complex. The intricacies of combining multiple UV maps led to a longer process of refining. There was difficulty in building the scripts, but with the help of the programmer, scripting became easy to learn. Picture left: The model is seen in Unity platform space. Screen shots are seen from the interactive screen. User is placing injection targets on the patients face. References Allen, Lauren K., Eagleson, Roy, and de Ribaupierre, Sandrine. (2016, March). “Evaluation of an Online Three-Dimensional Interactive Resource for Undergraduate Neuroanatomy Education”. Anatomical Sciences Education. Web. 17 Sept. 2016. Allergan. (2014). 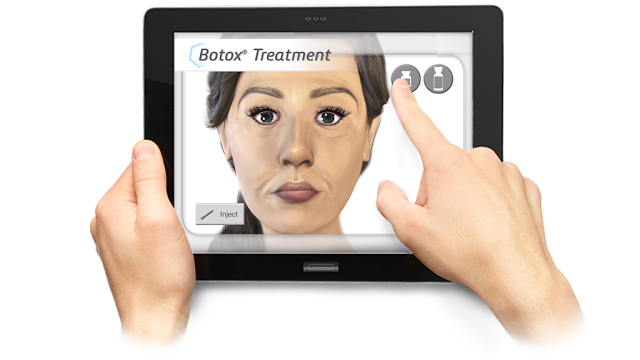 “Virtual Botox: Haptic App Simulates Injecting The Real Thing”. Web. 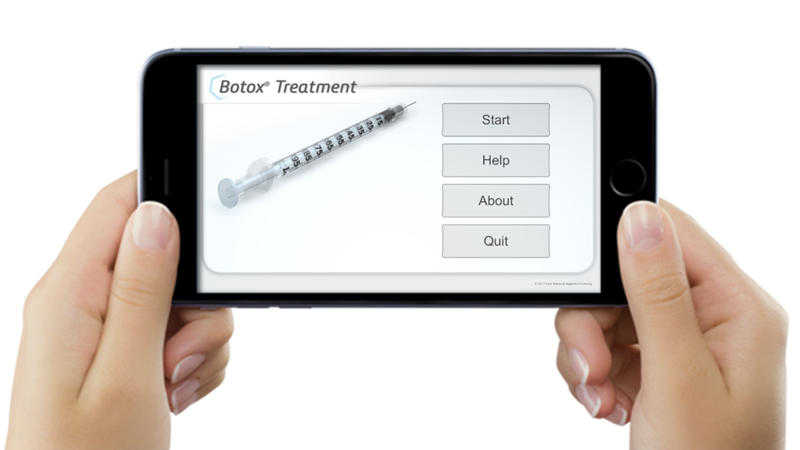 21 Sept. 2016. https://www.inition.co.uk/case_study/virtual-botox-haptic-app-simulates-injecting-realthing/. Gordon, James A., Pawlowski, John. (2002). “Education On-demand: The Development of a Simulator-based Medical Education Service”. Academic Medicine. Web. 17 Sept. 2016. Graber, Mark A., Wyatt, Christopher, Kasparek, Leah, and Xu, Yinghui. (2005). “Does Simulator Training for Medical Students Change Patient Opinions and Attitudes toward Medical Student Procedures in the Emergency Department?”. Academy of Emergency Medicine. Web. 17 Sept. 2016.Hanke, William C., Moy, Ronald, Roenigk, Randall K., and Roenigk, Jr, Henry H. (2013, October 7). “Current status of surgery in dermatology”. J AM ACAD DERMATOL. Web. 19 Sept. 2016. Lam, Charlene, Crites, Joshua S., Clarke, Jennie T., Miller, Jeffrey J., and Kirby, Joslyn S. (2014). “The use of donated products to train residents to perform injectable cosmetic procedures”. Dermatoethics Consultation. Web. 18 Sept. 2016. Lee, S., Lee, J., Lee, A., Park, N., Lee, S., Song, S., Seo, A., Lee, H., Kim, J.-I., Eoma, K. (2012). “Augmented reality intravenous injection simulator based 3D medical imaging for veterinary medicine”. The Veterinary Journal. Web. 18 Sept. 2016. Okuda, Yashuharu, Bryson, Ethan O., Demaria Jr., Samuel, Jacobson, Lisa, Quinones, Joshua, Shen, Bing, and Levine, Adam I. (2009). “The Utility of Simulation in Medical Education: What Is the Evidence?”. Mount Sinai Journal of Medicine. Web. 21 Sept. 2016. Peterson, Diana, Mlynarczyk, and Gregory S.A. (2016). “Analysis of Traditional Versus Three- Dimensional Augmented Curriculum on Anatomical Learning Outcome Measures”. Anatomical Sciences Education. Web. 21 Sept. 2016. Santan, Sally A., Hemphill, Robin R., Spanier, Cindy M., and Fletcher, Nicholas D. (2005). “‘Sorry, it’s my first time!’ Will patients consent to medical students learning procedures?”. Medical Education. Web. 21 Sept. 2016. Shen, Yunhe, Vasandani, Pankaj, Iyer, Jayesh, Gunasekaran, Arjune, Zhang, Yingchun, Burke, Daniel, Dykstra, Dennis, and Sweet, Robert. (2012). “Virtual Trainer for Intra-Detrusor Injection of Botulinum Toxin to Treat Urinary Incontinence”. Medicine Meets Virtual Reality. Web. 17 Sept. 2016. Surgery Squad (2016). Web. 21 Sept. 2016. http://www.surgerysquad.com/surgeries/virtualbotox/. Wang, Leo L. (2016, January). “Gunner Goggles: Implementing Augmented Reality into Medical Education”. Studies in Health Technology and Informatics. Web. 17 Sept. 2016.